The Journal of the American Medical Association (JAMA) today published the validation study of our clinico-genomic database (CGDB), showing that real-world clinico-genomic data obtained during the course of routine patient care can yield scientifically and clinically meaningful insights. The study ‒ “Association of patient characteristics and tumor genomics with clinical outcomes in patients with non-small cell lung cancer (NSCLC) using a clinico-genomic database derived from routine clinical care”1 ‒ describes the scientific rigor and HIPAA-compliant methods used to develop our CGDB, which we strongly believe will be a critical tool in advancing drug discovery and development in oncology. This is a significant development towards the possibility of leveraging regulatory grade, real-world data to impact precision medicine. This continuously-updated, de-identified database includes patient outcomes data from Flatiron’s network of oncology clinics linked with comprehensive genomic profiling (CGP) results from Foundation Medicine’s FoundationCORE™ database. At the time of the study, the CGDB included nearly 29,000 linked patient profiles, approximately 85 percent of whom were treated in a community setting. Today, the CGDB contains 50,000 linked profiles and continues to grow with every quarterly refresh of the database. 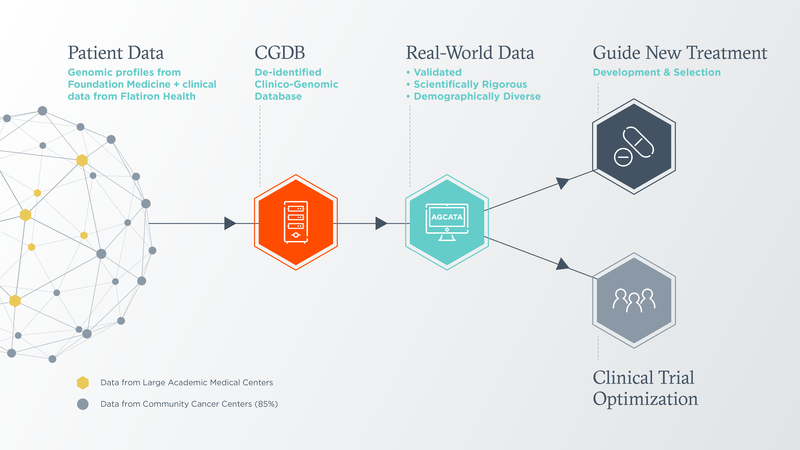 As the dataset grows and additional methods and proof points are established, we anticipate that the CGDB will become a critical asset advancing therapeutics development and optimizing clinical trial design and execution, especially for those populations historically underrepresented in clinical trials. Ultimately, these same data sets, analytic capabilities, and validated methods will be instrumental in deploying these types of real-world data to optimize clinical decision making for individual cancer patients. At Foundation Medicine, we believe that these types of real-world datasets, when validated rigorously as this study published in JAMA represents, will help us drive the future of oncology research and improve care for cancer patients everywhere. With this foundational milestone in place, we are excited to begin the next leg of this important journey – to translate this dataset into insights that advance our understanding of cancer biology, molecular biomarkers, and, ultimately, a better understanding of which medicines will work for which patients, making sure that each and every doctor is able to provide high quality, data-driven, personalized cancer care. 1 Singal G, Miller PG, Agarwala V, et al. Association of patient characteristics and tumor genomics with clinical outcomes in patients with non-small cell lung cancer using a clinico-genomic database derived from routine clinical care. JAMA. 2019;321(14):1391-1399. 2 Janne PA, Smith I, McWalter G, et al. Impact of KRAS codon subtypes from a randomised phase II trial of selumetinib plus docetaxel in KRAS mutant advanced non-small cell lung cancer. Br J Cancer. 2015;113(2):199-203. 3 Barlesi F, Mazieres J, Merlio JP, et al. Biomarkers France contributors. Routine molecular profiling of patients with advanced non-small-cell lung cancer. Lancet. 2016;387(10026):1415-1426. 4 Goodman AM, Kato S, Bazhenova L, et al. Tumor mutational burden as an independent predictor of response to immunotherapy in diverse cancers. Mol Cancer Ther. 2017;16(11):2598-2608.